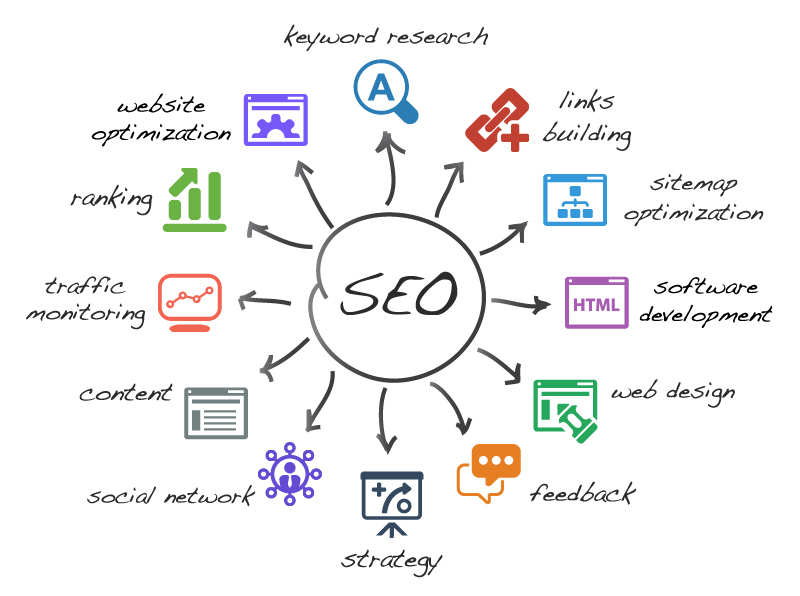 Search Engine Optimization (SEO) refers to a set of strategies and methodologies designed to drive increased traffic to a web page or website through increased exposure in search engines. This is achieved by obtaining a consistently high ranking in the organic search results for the targeted keywords of a website, ensuring that the traffic is coming from qualified visitors who are likely to convert into sales. Levy Online offers truly effective SEO strategies. Our team consists of professional, highly skilled individuals, who have proven themselves to be at the top of their game, each with years of experience in online marketing and a proven track record of success. We hire only the best candidates, sourced nationwide, and our entire team is in-house and successfully executing SEO in Las Vegas and around the country for a variety of different industries. Think you have what it takes to join our team of experts? Visit our careers page and let us know! If you would like to learn SEO, we have a place for you to get started as well. We strictly adhere to webmaster guidelines of the leading search engines such as Google, Yahoo and Bing, to offer you long-lasting and consistent search engine rankings. The integrity of your brand is important, so we always play by the rules. We will never put your brand at risk of penalization by the search engines. If you are currently experiencing this sort of problem, our staff can resolve and remove existing penalties. We see more and more of our clients coming to us after hiring a low-quality Las Vegas SEO, asking us to remove their penalties. We’re able to remove them, but it’s always better to have never had the penalties in the first place, which is one of our priorities. Our goal is to help you rank higher for your main keywords, as well as longer phrases people also type in to search engines. There are many elements that the search engines require to properly index your site and rank it for your desired terms. This involves a variety of different elements such as; the way the website is coded, internal link structure, meta tags, content issues, use of your keywords within the pages in specific ways, robots.txt, XML sitemaps, link building, traffic analysis, and much, much more. Levy Online will work closely with you and your team to structure the code optimally, the way the search engines want to see it. Our Las Vegas SEO content writers will write compelling, relevant content that makes effective use of your keywords and phrases. Unlike the pay-per-click (ppc) model, all of this is designed to increase the organic returns of your website in relation to searches for your products or services. On-page SEO: This includes all factors that search engine bots take into consideration when crawling through the code of your website. The quality of the website design, the content, site structure, meta data, and the way the code of the website is structured can have a heavy impact on where websites rank in search engines and who clicks on them. Off-page SEO: In addition to the on-page elements that can affect SEO, there are also a significant number of off-page elements that need to be optimized in order to gain the highest ranks possible. The largest element of off-page SEO (in Las Vegas, especially,) and the element we focus the most on, is link building. Making sure other relevant websites link to yours not only helps SEO, but can also result in an increase of referral traffic from those links. Technical SEO: This refers to the elements that can effect SEO, but don’t quite fall into one of the two categories above. Elements such as site speed, server setup, robots.txt files, and .htaccess files are also all optimized as part of our services. Local SEO: You may have noticed more search engine results displaying “map packs” when keywords in your industry are searched. These are clusters of local websites that show up on maps and search results when someone is searching for something near them. We specialize in ranking your website on top of local listings as well as organic results. To get your business on top of Google Maps and other local listings, a combination of specific tactics using on-page, off-page, and technical SEO are required. Penalty Detection and Removal: Search engines like Google have increased the amount of, and the reasons for, penalties they give to websites. If you’ve noticed a significant drop in website traffic, this could be the reason. All of our Las Vegas SEO tactics follow webmaster guidelines to ensure we don’t cause any penalties, and we have a lot of experience removing existing penalties for our new clients. Analytics and Webmaster Tools Monitoring: We constantly monitor your website traffic, ranks, and the data in your webmaster tools accounts. By doing this, we can catch anything either positive or negative that is happening to the account and react right away.